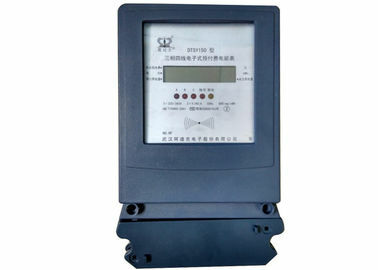 DTSY150D electric meter is worked by contact type IC card.However, open IC card, which is easily affected with the environment, need to be protected and will creates extra expense and inconvenience. Adopts encrypted contact-less IC card for prepayment, the power company collect the credit by selling the IC card to realize "Pay As You Go". Full digitalized metering combing with , power consumption display, prepayment control, card reading and smart anti-tamper, so it has the high reliability. Overload protection:the load exceeds about 20%~30% of max. current lasting for 30 seconds, the meter will cut off the power circuit. Multiple encryption is used in the card to make sure of safety, accurate, and reliability of the data from the meter, and the card is designed with special technology that can record the remaining credit and accumulated power consumption, and anti-fraud action. LCD screen shows the remained credit with two decimals (currency unit: CNY) for 10s, and unit price with two decimals (currency unit: CNY) for 5s, and accumulated/current power consumption with one decimal (unit:kWh) for 5s in scroll. Contact-less IC card can adjust to any environment. LED lights for power missing. One meter can support for multi-user usage in time-sharing period. Has the function of time-zone management. Supports for maximum demand, and alarm function. Magnetic latching relay applied in the meter improves the reliability of the outage power, reduce the power consumption after the outage,also solves the problem of contactor adhesion caused by long time operation of relay under the condition of large current. R&D Group: The main senior R&D staff graduated from the Air Force Radar College. After establish the enterprise, it has develop the own R&D team which has 57 R&D technician( 28.5% of company employee). They can R&D various electric meter and related products independently through the internal and external training and practice. It has 25 patents which has 19 Utility Model patents, 4 Appearance Design patents, 2 Invention patents. “DDZY150/DTZY150 series smart electric meter key technology and application” has won the science and technology progress prize of Hubei province in 12, 2015. It can R&D different types of electric meter and related products independently and has the modify and update R&D capability. Production and technicians have passed the strict training before working which has the strong sense of quality and also has the technical skills. Management: We have a high efficiency, innovative, serious management team, and the factory has already passed ISO9001-2008 QMS, and ISO14001-2004 environment management system. It has not any batch quality problem since establishment. AQSIQ( State Quality Inspection Administration) take the spot checking of our electric meter during 2009-2016, and all the meter passed the inspection. Fully proved that the production is according to our quality management system, and the product quality is stable and reliable. Principle: It pursues “Military Academy, Military Morality, Character, Integrity”business philosophy. According to the “ Success once at a time, Advance and reliable, Customer satisfaction, Continuous improvement” quality policy, produce the military high standard products depend on the talent and technology advantages. By military character, do the man first and then work, and provide the high quality products and favorable service to the domestic and overseas clients. With the high quality products and favorable service, it has won the good reputation from clients and won the large market share. (The group users has more than 3000).